Gustav has been moving west-southwest this evening. It sure looks like it is going to go over Jamaica by late this morning into the afternoon. Even if it just clips the coast of Jamaica, it may be enough to cause a temporary weakening again. As soon as Gustav hit the waters of the Caribbean Sea it started to develop very rapidly. This is seen on the I.R. satellite imagery with the burst of deep convection over the center of circulation. 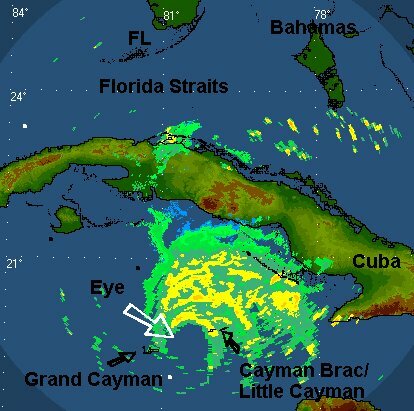 The center is still also discernible (barely) on the south Cuba radar. The Hurricane Hunter is on the way to investigate now. We expect them to find stronger winds this time around. The forecast models are still taking Gustav into the central Gulf of Mexico during the weekend with landfall somewhere in Louisiana by Monday. NHC has basically picked New Orleans as the landfall spot. We believe part of the reason for this is to get people motivated to take action. Overall the models have it a bit farther west of New Orleans. It is very interesting to note that the models have done extremely poorly so far with the intensity forecast. We have a minimal tropical storm at this time. A few days ago, the models had predicted a cat 1/2 hurricane. The stop over on the southern peninsula of Haiti threw a monkey wrench into the first part of the forecast. It appears also that the weakness in the high may be sufficient to allow Gustav to move northward into the northern Gulf. Since this is in the day 4-5 range we still need to follow this very carefully. If this forecast actually materializes, some locations that have been in a serious multi-year drought may get round 2 of heavy rain by Sunday into early next week for the Labor Day weekend. Gustav is in the Jamaica channel and is about to make landfall on Morant point which in not far to the east of Kingston the capital. The main effect on Jamaica will be heavy rainfall which could total 10" or more. The winds have become a concern now with top sustained winds of 70 mph by NHC. This looks reasonable considering the last reports from the Hurricane Hunters. The last pressure measured earlier was 985 mb, about a 14 mb drop since it moved off of the coast of Haiti. 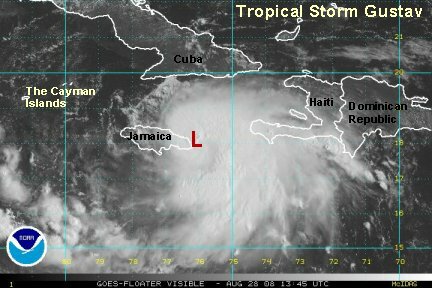 NHC strengthens Gustav <i> over Jamaica</i>. We think that Jamaica may temporarily weaken Gustav or keep it from strengthening briefly, especially if the center passes directly over the Island. 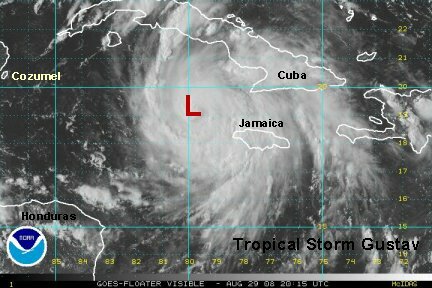 There is some evidence that it will pass over the eastern tip and south of Jamaica. This is interesting since the official NHC forecast from last night had it moving to the north of the Island. This is why we need to be careful when interpreting hurricane tracks, especially out to day 5. You would think that Day 1 would be easy. If Gustav does pass to the south strengthening will continue. 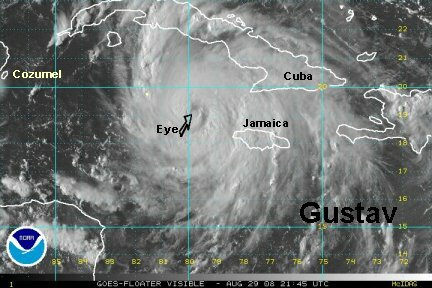 The satellite imagery shows that the structure of Gustav has improved markedly, and that there is no reason to think it won't develop, possibly rapidly west of Jamaica. 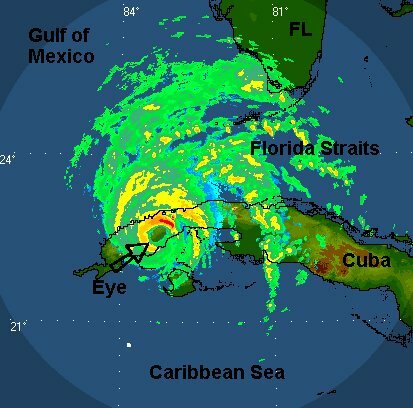 Gustav is now moving out of the Cuban radar range and it is no longer a useful tool for tracking it. The official NHC track was shifted west of New Orleans. We we pointed out in our previous update, that we thought NHC was doing this to get people motivated in the northern Gulf. They have now shifted their forecast westward into the central coast of Louisiana. This is where the center of "spaghetti chart" models are located. The most reliable models are in the area too, so there's no evidence not to go with this scenario at this point. In the near term, interests in the Cayman Islands and Mexican Yucatan need to follow the progress of Gustav closely. 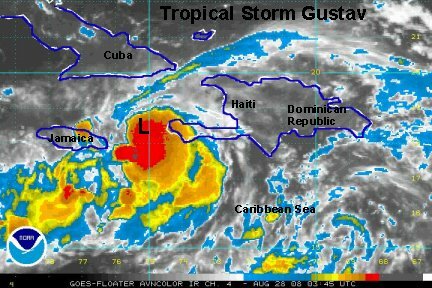 Gustav is now over eastern Jamaica. It appears that it will move straight across the country. This will likely slow or stop strengthening briefly. Strenghtening will likely commence later this evening or tonight. The winds shifted abruptly at Kingston, Jamaica between 4-5 pm. At 4 pm Kingston was reporting wnw winds at 44 mph then switched to ene at 28. A pressure of 990 mb was reported as Gustav went right over Kingston. Gustav is now in the Caribbean Sea again, and should begin to strengthen rather shortly. Outflow aloft is looking favorable for strengthening as the mid level ridge is now taking over and the northerly shear has dissipated. We look for steady strengthening as Gustav heads for the Cayman Islands by Friday evening and near the Yucatan channel by Saturday noon. There is potential for rapid strengthening as Gustav heads into the northwestern Caribbean Sea and southern Gulf. Rapid strengthening is still not very well understood and can only be predicted when the beginning of a cycle is noticed on satellite imagery. We nor NHC is predicting this at this time, but it is certainly something that we'll be watching for later tonight and tomorrow. The models have been pretty steady still taking Gustav toward the north central Gulf by Monday. The Louisiana coast is still in the center of where the models still believe Gustav will make landfall. Remember, rain bands can extend hundreds of miles east or west of where the center makes landfall. Squally weather can be expected as far east as western Florida or eastern Texas if Gustav does make landfall in Louisiana. We try to caution folks not to get too excited about a day 4 or 5 forecast when a hurricane track is concerned. The average error is about 300 nm at day 5. Well, a run of one of the more reliable models now has Gustav much farther east. In fact, instead of central Louisiana, it has a landfall early Tuesday near Mobile, AL. Is this new forecast right? We don't know yet, but certainly with the slower speed of Gustav getting tangled up in the Haiti and now Jamaica mountains, it wouldn't surprise us. When something like this happens we look to see if the next run or two of the models support the shift. Most of the "spaghetti chart" models are still pointing to central Louisiana. The critical timing of upper air troughs and high pressure ridges building back in can be very tricky. This new forecast - which we have not bought yet brings Gustav up the the Alabama coast inland slightly then west near the Louisiana coast as the high builds back in. This is why you shouldn't pay too much attention to forecasters that show a huge hurricane on day five or talk about warmer water causing a massive hurricane on day 5. The forecast models just aren't good enough in general to start us talking about the details of a forecast that far in advance. So far, the track of Gustav has been wild, with no model accurately predicting it a day or two out. Right now Gustav is fighting the effects of the Jamaican mountains. The low is near the south central coast. Once it pulls away during the day Friday we expect it to become a hurricane as wind shear will not be an inhibiting factor. There is a possibility of rapid deepening in the northwest Caribbean, so we'll be watching for this tomorrow and Saturday. First, we need to say that last night's late run of the model that took Gustav into Mobile has backed off. But, with that being said, all of the models shifted east last night too. They are now more toward southeastern Louisiana. The models now take Gustav across western Cuba instead of over the eastern part of the Yucatan channel. We need to be very careful with this forecast. The models have been struggling with a one or two day forecast so far, so its no surprise that day four or five might change. Right now, Gustav is moving into the Caribbean Sea just west of Jamaica. NHC has maximum sustained winds at 65 mph. This is too high. The last recon measured a flight level wind of 54 knots and estimated the surface wind at 36 knots. The maximum sustained wind is probably 45-50. We expect that the winds will come up very fast soon and that it will become a hurricane probably by later today. As mentioned earlier, there is still the possibility of rapid deepening. Last edited by Caribbean Traveler on Fri Aug 29, 2008 12:59 pm, edited 1 time in total. The latest recon shows that the pressure is dropping, now down to 984 mb. Surface winds were estimated at 57 knots and it looks like an eyewall is beginning to take shape. 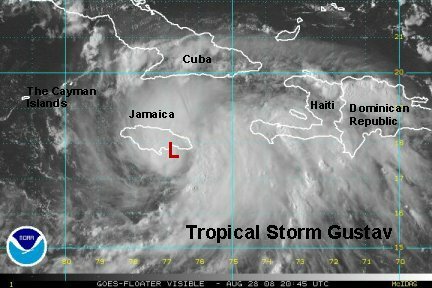 Gustav should reach hurricane strength by late this afternoon or this evening. There are now no appreciable land masses to disrupt the circulation like Haiti and Jamaica. We'll evaluate the models again later this afternoon-evening. The late morning run still had Gustav heading toward southeast Louisiana. 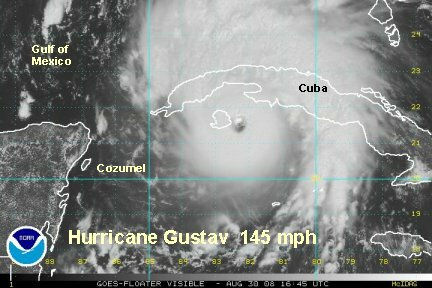 A colleague mentioned that Gustav was upgraded to hurricane strength at 3:15 pm edt. 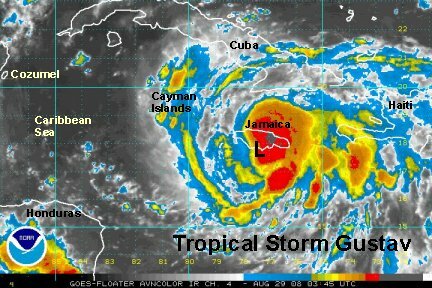 Gustav is now a hurricane at 75 mph. The last Hurricane Hunter recon showed a surface wind of 78 knots. Satellite imagery shows that the outflow has improved aloft and supports intensification. 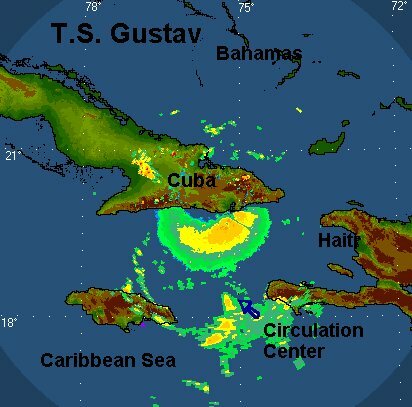 Gustav is moving toward the western end of Cuba and will pass over Cuba by tomorrow afternoon. It is doubtful that the terrain of Cuba will have any important effect on the strength. We continue to watch for rapid intensification, and Gustav may be a major hurricane (cat 3 or higher) before it gets to Cuba. There is certainly the possibility that Gustav will make landfall as a major hurricane and residents should begin to prepare for that possibility. We will address this issue more tomorrow when we see exactly what strength Gustav will enter the Gulf. Prepare for the possibility of landfall as early as Monday or Tuesday if the high strengthens. The models have not changed much other than that one crazy run last night. The most likely landfall position at this time remains southeast to south central Louisiana. We will check the new model run coming in during the next 1-2 hours. Of course we'll pass along any important changes. The models show almost no change...southeast to south central Louisiana sometime Monday. Remember the effects of the hurricane will precede the hurricane by many hours depending on how strong it is. Next update: Saturday Early AM Mini Update. 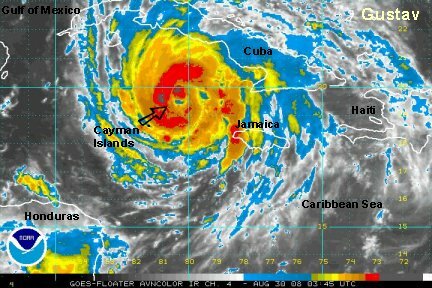 Gustav is moving directly in between the Cayman Islands. Grand Cayman is in the western eye wall and Little Cayman and Cayman Brac are in the eastern eye wall. Strong winds and power outages have been reported. Heavy rain is also noted just offshore of the south Cuba coast. Rain will increase in intensity as Gustav approaches western Cuba and crosses by Saturday evening. 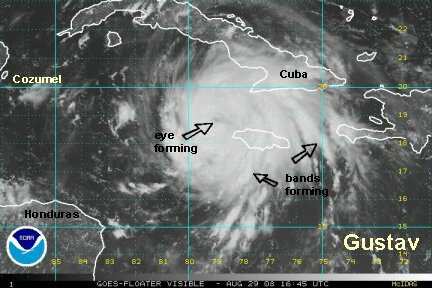 Western Cuba should not affect the structure of Gustav very much or at all. To this point rapid deepening thankfully has not occured. A very steady drop in pressure has been measured and 971 mb was the last pressure received from the Hurricane Hunters. 24 hours ago the pressure was nearly 20 mb higher. We will still watch for the possibility of rapid deepening in the northwest Caribbean as well as the southern Gulf Saturday and Sunday. A wind gust to 98 mph was measured at flight level and 87 mph for the surface reading. The models have been very steady taking Gustav toward the southeast/south central coast of Louisiana by Monday evening. 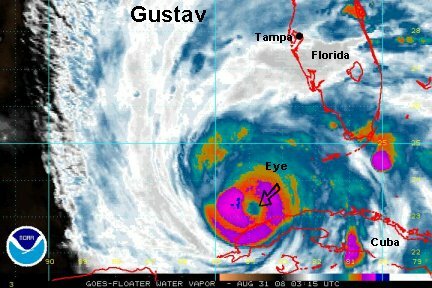 It is very possible that Gustav will make landfall as a major hurricane. After landfall another effect that will have to be watched will be inland flooding. The models stall Gustav over Louisiana and bring heavy rain into the neighboring states of Mississippi and Arkansas. They then take what is left of Gustav back out to sea! It's difficult to interpret what consequences that will bring, if any, if that actually happens. Right now, finish preparing by Saturday, especially on the Louisiana coast and inland regions near the water. Remember, the effects of hurricanes precede the landfall by many hours. Our fears were realized. 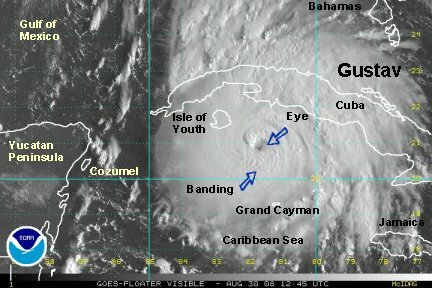 Gustav started a rapid strengthening phase late last night and continues until now. The banding seen on the visible satellite imagery is unmistakeable of a hurricane becoming much better organized. The northwest Caribbean Sea usually is a very favorable region for this to occur. 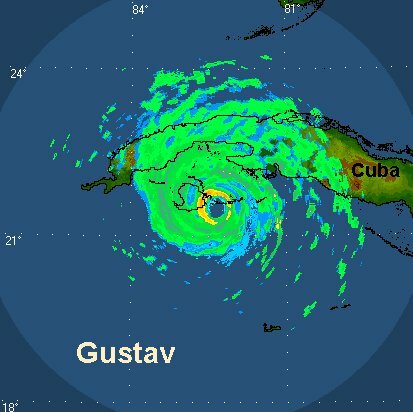 Gustav is heading to western Cuba. 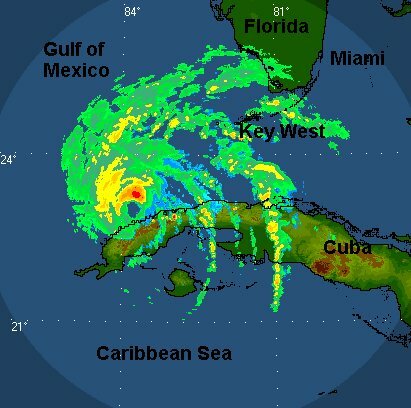 It will hit the Isle of Youth in a few hours and then western Cuba later this afternoon. We look for strengthening to continue into this afternoon. There may be a slight pause in strengthening as it passes over both land masses. The disruption will likely be minimal. Gustav looks to still be a major hurricane in the southern Gulf. It's possible that Gustav could continue to strengthen into a cat 4 over the next 24 hours. The models have not changed much for the exception of maybe slightly west. South central Louisiana is becoming the zone where the models are focusing on still. Remember that the tidal surge will be the strongest where it makes landfall and to the right (east) of that area. Last edited by Caribbean Traveler on Sat Aug 30, 2008 1:49 pm, edited 2 times in total. The rapid deepening cycle continues. Top sustained winds will likely go higher, maybe to cat 5 (155+ mph). The last recon measured 945 mb. This is a pressure drop of about 40 mb since 24 hours ago. This is now one big bad hurricane. It will probably be not as strong as this on landfall in Louisiana Monday, but you can't take the chance that it'll weaken much either. The midday run of the models didn't change. Central Louisiana is still the mostly likely landfall position. The last recon showed a pressure increase. The eye started to fill in also. These are both indications of weakening.....temporarily. We think Gustav will make a comeback over the nighttime hours. The 8 pm advisory has Gustav at 150 mph. The pressure went up from 941 mb to 952 mb and probably more since then. The Hurricane Hunters can not fly over Cuba, so can't sample the eye until it's away from the coast. The next report from NHC at 11 pm should show some weakening. Gustav will most likely make a run at becoming a cat 5 in the southern Gulf. Gustav has a very small core....Charley-like. This allows for very fast weakening and strengthening. This will be very important to watch! If Gustav's core or (CDO- central dense overcast) remains small, the storm tide problems will be greatly reduced. Katrina had a large circulation so was able to still up a huge amount of high waves. Gustav will do the same only if it grows by a good bit. The latest forecasts still call for Monday on the Louisiana coast. Anywhere from south central to southeast Louisiana still looks like the landfall point. Don't let your guard down if you live outside the core zone! Effects, especially on the right front quadrant (east side), may extend will east. Preparations need to be completed now. Listen to local authorities if they advise you to evacuate. Stay informed and stay safe. Next update: Saturday night mini Update. 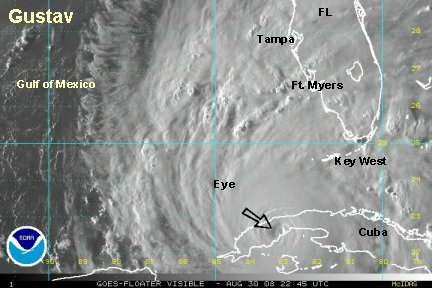 Gustav's eye is back out over the Gulf. It has a small core, so it will likely recover the strength that it lost over Cuba and then some. It could become a cat 5 later tonight or tomorrow morning. We will be watching to see if the cdo (cloud structure around the eye) increases in size. A small cat 5 hurricane may actually cause less damage than a very large strong cat 3 or 4. The larger the wind field, the longer the fetch over water to stir up huge battering waves on the coast. Of course, the wind damage would still be worse at the landfall point with a cat 5. Expect conditions to start going down hill by Sunday evening from the western Florida panhandle westward through Louisiana. Landfall is still expected near southeast or south central Louisiana. Conditions will worsen very quickly late Sunday night into Monday morning. Landfall time is forecasted near noon on Monday. Tidal surge will be greatest near and to the right (east) of landfall. If you are in a threatened zone, <b>do not</b> try to "ride the storm out".